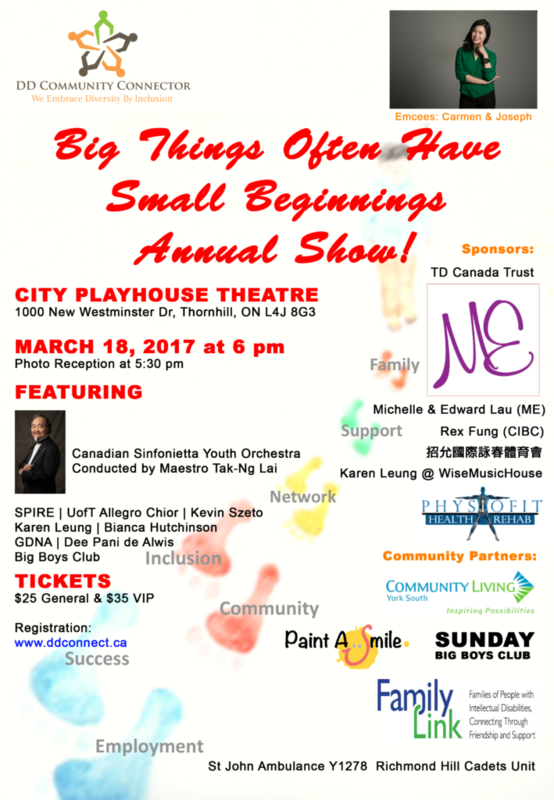 We thank you in advance for your interest in sponsoring the Big Things Often Have Small Beginnings Annual Show and our organization. Your support is crucial for our future programs serving People with Developmental Disabilities. Public Acknowledgement by poster, Facebook banner, program booklet and Emcees announcement. Public Acknowledgement by poster, program booklet and Emcees announcement. For more information, sponsor privilege, and online payment arrangement, please email info@ddconnect.ca with your name and contact information before January 31, 2017. We will contact you as soon as possible.